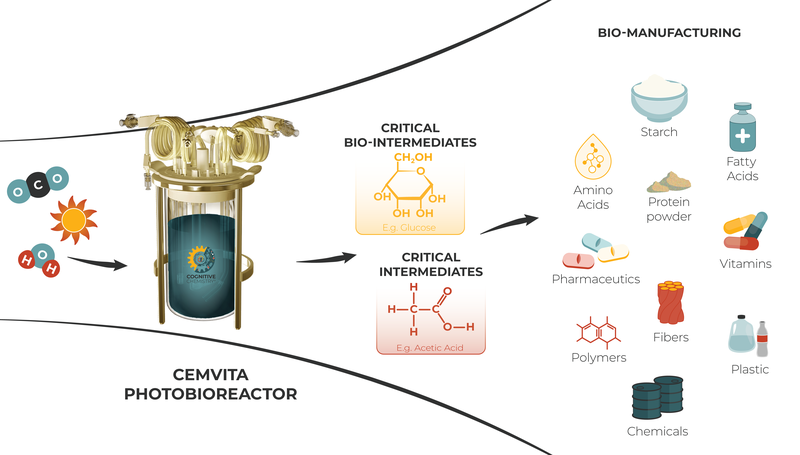 Our CO2 Utilization platform mimics photosynthesis to produce nutrients and pharmaceutics for deep space exploration and industrial chemicals and polymers for energy sustainability. Our CO2 Utilization platform merges the proven methods of electrochemical engineering and synthetic biology to reduce the energy uptake and increase the efficiency of CO2 conversion. This platform mimics the complete photosynthesis process by simultaneous uptake of solar energy, water, and processing of carbon dioxide to produce nutrients, phartmaceuticals, intermediate chemicals, and polymers. The technology can be used to process atmospheric carbon dioxide into oxygen and value-added products such as chemicals intermediates and polymers. Our technology offers a state-of-the-art versatile and self-regenerative system for producing many of the necessary substances for human planetary exploration including nutrients and pharmaceutics. One of the major challenges of a Mars mission is the production of human life support supplies. Currently, almost all supplies are supported from the earth. Dependence on earth is a risk for long-duration space missions. Therefore, development of innovative solutions for in-situ resource utilization (ISRU) is critical to provide a self-regenerative food system for long-duration space missions. One such ISRU solution can be modeled after natural photosynthesis in plants that can harvest the abundant solar energy to convert CO2 and water to glucose and oxygen. CO2 is an ideal feedstock for ISRU since astronauts breathe out 1kg/day/person of CO2, and 96% of the air consists of CO2 on Mars. CO2 and water are the main ingredients for production of a wide variety of life support resources such as nutrients and pharmaceuticals and the chemicals and polymers needed for establishing a settlement. Our mission is to create a sustinable future on earth and mars.